Thank you for coming along with the Cornell Lab during 2018, the Year of the Bird. In honor of the centennial of the Migratory Bird Treaty Act, we collaborated with Audubon, BirdLife International, and National Geographic to celebrate birds all year long during 2018, dubbing it the Year of the Bird. We asked people to take a simple pledge: to do one action per month to help birds. And to help spark ideas into action, we developed monthly themes, from all-day, worldwide bird counts, to gardening with native plants, to introducing a child to the wonders in our public lands. More than 180 nonprofits, public lands, birding clubs, and universities joined with us to help spread the word. Along with our partners, we started Year of the Bird—but tens of thousands of you carried it to success with your actions each month. During the two Global Big Days organized by eBird, you tallied more than 7,000 of the world’s 10,000 species. More than 55 state and local governments in the U.S. issued Year of the Bird proclamations or declarations. We at the Cornell Lab are grateful to everyone who participated and helped the world become a friendlier place for birds and bird watchers. Photos from Year of the Bird: This Northern Cardinal by Michele Black/GBBC kicked off the year with our 6 resolutions post. This Short-eared Owl peeking out from redcedar boughs highlighted our 5 Big Day tips for beginners post. Image by Sandra and Frank Horvath/GBBC. July's post centered on one of the most far-reaching actions you can take: getting kids into birds and nature. Image by Susan Spear/Cornell Lab. We're living in a golden age of bird and nature photography—and November's post highlighted the value of archiving your bird photos at our Macaulay Library. Red-legged Honeycreeper by Kacau Oliveira/Macaulay Library. Kickoff article in our magazine, by Cornell Lab director John Fitzpatrick: View from Sapsucker Woods: 2018 Is the Year of the Bird. January: Let’s get started! 6 Resolutions to Help You #BirdYourWorld in 2018. Master your bird songs, drink good coffee—it’ll be a great year. February: Great Backyard Bird Count. How to Have a Gaggle of Fun at the Great Backyard Bird Count. With a photo contest, prizes, friendly rivalries, and millions of birds to count worldwide, there’s simply no better way to spend your weekend. March. The value of native plants. A Yard Full of Native Plants Is a Yard Full of Well-Fed Birds. Native plants provide berries in winter and insects in summer—and the more the merrier. April: Protect the Migratory Bird Treaty Act. Storm Clouds Brewing for the Migratory Bird Treaty Act. Since 1918, the Migratory Bird Treaty Act has been a bedrock of conservation. Now, a narrow legal interpretation is aiming to strip away 100 years of wisdom and environmental protection. May: Global Big Day 1. A Beginner’s Guide to Big Days: 5 Handy Tools for Planning and Recording. Big Days make for a fun reason to go bird watching any day of the year. They can be as long or short, serious or carefree as you wish. And whatever your goals, these simple tools and tips can help you plan your perfect day. June: Cut out plastic. Laysan Albatrosses Survived The Feather Trade, Industrial Fishing, And Plastics. What’s Next?. As our oceans fill up with plastics, take some hope from these majestic seabirds. Their resiliency has surprised us before, and now it may be the key to their future. Find out how. July: Get a child into birds. 5 Tips for Fun Field Trips. Help a child forge a connection with nature and you don’t just enrich the child, you make a brighter future for birds. Here’s how to get started. August: Celebrate public lands. Eight Great Reasons to Love the Migratory Bird Stamp. There’s probably no better bargain when it comes to directly supporting conservation on public lands—and a “Duck Stamp” lets you enjoy our grand National Wildlife Refuge system for free. September: Help migrants on their way. The 9/11 Tribute in Light Is Helping Us Learn About Bird Migration. It’s a vivid memorial to one of the worst days in American history—but through teamwork it has also become a powerful study in how city lights affect migrating birds. October: Global Big Day 2. 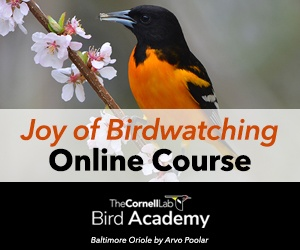 New, Free eBird Essentials Course. With this short, fun, and free course, you’ll be using eBird to make lasting bird memories in no time—providing valuable data to scientists along the way. Explore now in time for October Big Day! November: The power of photography. Calling Photographers: Share Your Favorite Shots, for Science. We’re living in a golden age of photography. Here’s how to give your bird photos lasting impact: by sharing them with our scientific archive. December: Help birds this holiday season. Great Gifts That Do Good: A Bird Lover’s Guide. If you’re looking for ways to say “I treasure you” to your loved ones and to the planet simultaneously, we’ve got a few good ideas to get you started.